ConnectCaju’s mobile application-based platform puts crucial data at the fingertips of government officials and cashew farmers in Mozambique. 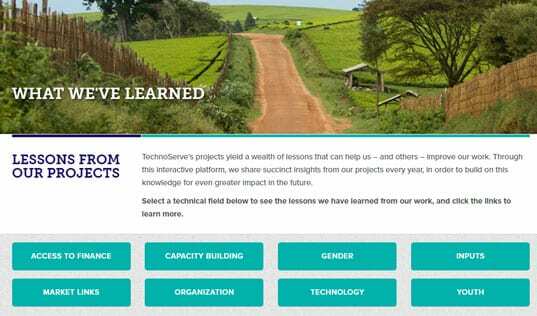 ConnectCaju is an information and communication technology platform being developed by TechnoServe and the Government of Mozambique’s Cashew Promotion Institute (INCAJU) that will improve the coverage and quality of agricultural extension services. By delivering relevant and timely information, ConnectCaju is helping cashew farmers improve production and access markets. Over 1.4 million households in Mozambique produce cashew, an important cash crop and contributor to the country’s rising GDP. Yet despite rapid growth in the industry over the past two decades, Mozambique currently operates far below its potential in cashew production. If cashew farmers plant 10 million new cashew trees, improve the health of existing trees, and address major challenges such as a lack of information and market linkages, Mozambique could triple its production in the next 10 to 15 years. As the primary agency responsible for promoting this growth, the Government of Mozambique’s Cashew Promotion Institute (INCAJU) has been supporting cashew farmers through agricultural extension services, which include sharing good agricultural practices and distributing inputs such as seedlings and crop protection tools. In order to make better and more informed decisions on the policies and assistance it provides to cashew farmers, INCAJU needs quality, consistent, and timely data to analyze gaps and needs. However, as with any government agency in a low-income country, INCAJU operates with a tight budget, at times facing a shortage of resources. One of the agency's biggest constraints is lack of a system for collecting and disseminating information on cashew farmers and the industry as a whole. Recognizing that technology can provide a solution to some of the issues facing the cashew industry, TechnoServe piloted an SMS-based platform in 2015 to connect farmers to markets as part of the USDA-funded MozaCajú project. The platform was very simple: using smartphones, TechnoServe registered cashew farmers’ basic demographic data and contact information in a system that allowed communication to and from the farmers. A farmer could indicate via SMS to the system when he or she had any harvest available for purchase and that information would be passed along to interested buyers. Following the success of this pilot, TechnoServe partnered with NorgesVel and INCAJU to expand the scope of the platform and build out further functionalities that would increase the effectiveness and efficiency of various actors in the industry, especially INCAJU. This became known as ConnectCaju – a mobile application-based platform that facilitates field-level, local data collection and dissemination that can be analyzed in real time by INCAJU and used to inform its decisions. The platform is divided into five different applications that collect and disseminate data in several areas, including cashew farms and farmers, cashew seedlings and nurseries, trade in cashew during commercialization, and weather. INCAJU supervisor Mateus Come (right) and TechnoServe Fellow Lawrence Haidome review live data coming in from the field. The primary functionality of the ConnectCaju platform is the Farm and Farm Management application, the core of which is a national-level registry of cashew farmers. 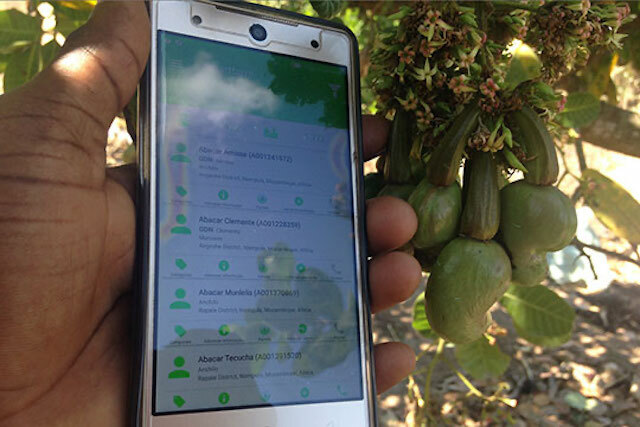 Using the application on a smartphone, INCAJU extension agents record important information about each cashew farmer in their area, including the farmer’s name, phone number, number of cashew trees, area of land, and geotags for the farm location and perimeter. A web dashboard supports INCAJU managers to monitor the registry in real time and to track data on production, disease outbreak, new planting, and so on – information which can more efficiently produce reports that help their decision-making. Moreover, the registry facilitates direct information sharing between the farmers and INCAJU via SMS. To date, over 80,000 cashew farmers have been registered in the system, representing nearly 8 percent of all Mozambican cashew farmers. "By using the platform, we are now able to collect, process, and safely store data about farmers and farms." Armando Braimo is a district supervisor with INCAJU who oversees extension agents in Moma District of Nampula Province. Previously, extension agents and supervisors like Braimo had to rely on handwritten and outdated lists of the cashew farmers to plan their extension services. Now he has registered over 1,200 farmers in the system, all with different plot sizes and tree counts. For example, he registered Carlos Anacleto and his 12-hectare farm with 840 cashew trees, and geotagged the plot so it appears on the system's map. Through the platform, Armando has been able to send messages directly to farmers like Carlos to advise on how to manage their farms or share weather information. Recently, he sent a reminder when it was time to spray the trees with protection against pests and diseases. ConnectCaju also has a Seedling Tracking application, which monitors the allocation and distribution of seedlings from multiple sources, especially from INCAJU nurseries, and provides information to research and development agencies interested in seedling survivorship rates. This helps INCAJU at different levels to make allocation decisions and to inform farmers of the availability of seedlings well-suited to their profiles. Similarly, a nascent Nursery Management application enables the tracking of seedlings through each stage of production in the nursery, helping to forecast seedling availability, monitor nursery performance, monitor nursery workforce, and increase the overall efficiency and productivity of each nursery business. The Commercialization application enables INCAJU to improve the transparency in the trading of raw and processed cashew nut purchases through more effective and timely monitoring of volumes, prices, and quality during commercialization. During the last commercialization season, when the application was piloted, Armando recorded 42 transactions, collecting information from cashew farmers themselves as well as intermediate traders and factory procurement teams. Lastly and still under development, the Weather application provides basic weather forecasting for farmers at the province level and provides localized advisory messages that are generated automatically by the system. INCAJU experts provide parameters that reflect the conditions that create specific risks, such as the combination of temperature, rainfall, and duration conditions that tend to trigger the severe disease outbreaks that plague cashew production. The system takes local weather data from satellite feeds, crunches the algorithm, and generates timely and appropriate advice. Currently the application sends about 2,000 SMS messages per week to farmers. INCAJU agents like Armando can already see how this platform will help INCAJU better support cashew farmers and the industry as a whole. "The platform has made it easier to have a lot of information in the palm of our hands," says Armando. With ConnectCaju, cashew farmers and traders can record their sales digitally during commercialization season. The senior management back at INCAJU headquarters have noticed the impact as well. 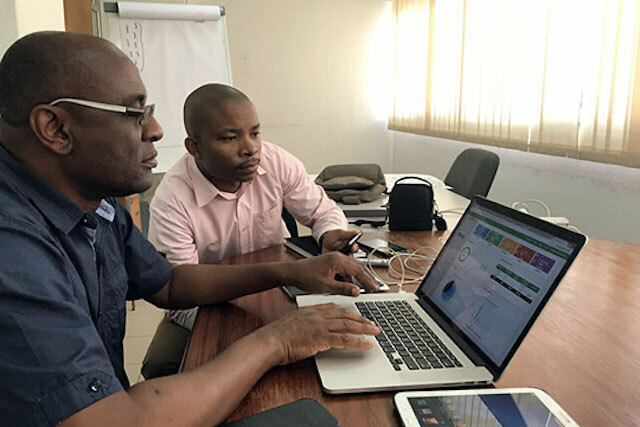 "The ConnectCaju platform is allowing INCAJU to migrate from paper-based forms to digital forms, making the access to information quick and easy over time,” says Humberto Guibunda, the Head of Department of Development and Technology at INCAJU in Maputo. "By using the platform, we are now able to collect, process, and safely store data about farmers and farms. 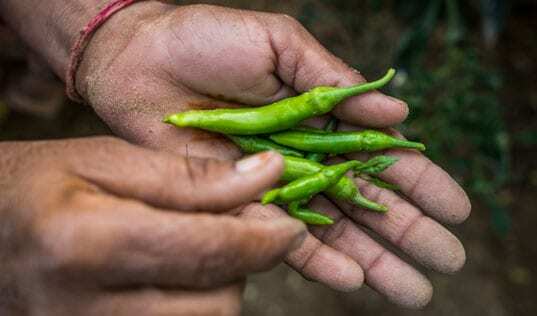 Besides, we can easily monitor activities and provide technical assistance and support to farmers in real time, therefore, shortening the response time." 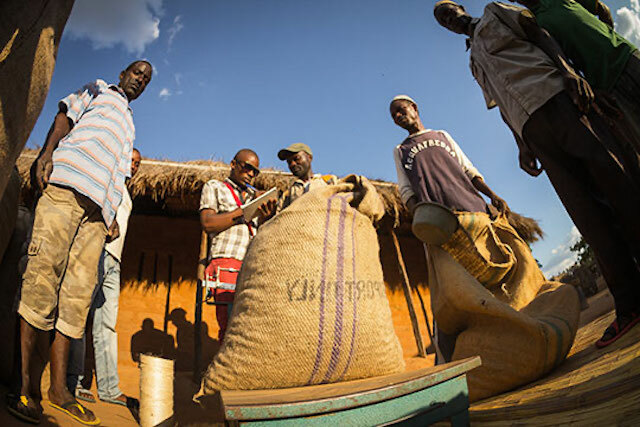 By the end of 2018, ConnectCaju will have registered 100,000 cashew farmers into the database, allowing for the electronic monitoring of around 25 percent of the harvest commercialised in northern Mozambique. The platform will also track seedling and inputs distribution, and bring together a cross section of value chain actors to test new linkages through the system. By improving INCAJU’s monitoring, analysis, and decision-making abilities, ConnectCaju is contributing to increased productivity and transparency across the sector. The platform will connect different actors in the production and commercialization arenas in ways that enhance their abilities to make timely decisions and reduce costs. This in turn will improve incentives for cashew farmers like Carlos to invest in greater production, thus leading to improved economic growth.